Coming from Al Ain, I was struck by the amazing infrastructures that I saw along the way. I was able to take my first glimpse of the newest world’s tallest structure Burj Khalifa. I was indeed taken in awe when I saw the buildings and roads that was unimaginable considering a desert country to boom into a highly industrialized and urbanized place like that. Dubai’s economy was originally built on oil industry but now it contributes only a very small percentage. It highly depends now on tourism, property and financial services. Now its booming with innovative large-scale construction projects, very ambitious at that, however it was reported that its undergoing a difficult financial times. 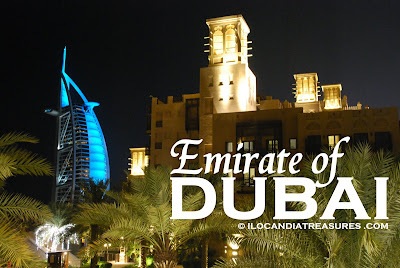 Dubai is the second largest emirate after Abu Dhabi in terms of area while it has the largest population. The Filipinos here accounts for 2.5% of the total population. This emirate is being ruled by the Al Maktoum dynasty with Mohammed bin Rashid Al Maktoum who is the current Prime Minister and Vice-President of UAE. Its name was derived from Daba which means to creep attributed to the Dubai Creek’s flow inland. I was picked up by my friend Franie Maquinay from Jumeira Beach Park. Franie has been working here in an accounting firm for the last seven years. We were together in a ship program of the Japan government. He took me at once at the landmark or iconic symbol of Dubai that is the Burj Al-arab. This is a seven star hotel considered to be the world’s tallest hotel. I have seen the wind tower which is a very important structure in a traditional house or building. He treated me later with a dinner of Arabic food at the Damascus Restaurant. He then took me home introducing me to his wife Ef and children, Fiona and Flyn. 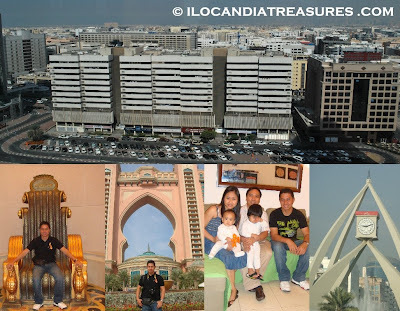 On the next day, he dropped me off to Deira where I saw the seat of the Dubai municipality as well as the Deira clock tower. I crossed the Dubai creek using abras, a traditional water transport to go to Bur Dubai. I visited the traditional souk where I bought some souvenir shirts then proceeded to spice and gold souk. I saw also the heritage village where it was composed of traditional houses. I have tried riding their bus transport which was expensive compared to Abu Dhabi. I rode the metro rail which is a brand new and highly sophisticated. I can only say wow with all those I saw. On my last day in Dubai, Franie took me to another seven star resort, the Jumeira Palm resort where I saw the Atlantis, the Palm, patterned after the one in Bahamas. It has 1539 rooms, an Aquaventure theme park, a Dolphin Bay, conference center and retail space. On its launch in 2008, several high profile guests were invited and spent USD 16M for a 15-minute fireworks display that lit up the place making it visible in the outer space. So extravagant indeed! Jumeira Palm is part of the artificial islands called Palm Islands resembling the shape of a palm tree which is a site for major commercial and residential infrastructure. I really had a grand time going around the place.